With a Mormon vying to be the Republican candidate for president, all eyes in the church's heartlands will be on the primaries, but one of those heartlands is Chorley in Lancashire. Driving down the M61 in west Lancashire one is struck by an extraordinary sight. On the edge of Chorley, nestled near the motorway, is a gleaming off-white church-like building, a sharp spire topped with a gold angel. But this is not a church, its lines are not that of a Norman chapel or a Gothic masterpiece. This religious building takes its cue from Salt Lake City, Utah. It is the main North West base of the Church of Jesus Christ of Latter-day Saints, perhaps better known as the Mormons. 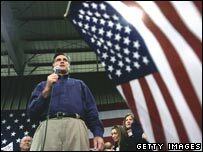 Republican Presidential nominee Mitt Romney's religion means all things Mormon have been more in the news than usual. But how many people know that the Mormons' association with the North West of England goes back further than their association with Salt Lake City? The oldest surviving branch of the church is not in the US, but in Preston. And at nearby Chorley, the church has one of its two UK temples as well as its missionary training centre. This is the place where the clean-cut young men and women who turn up on doorsteps around Britain every day get their grounding in spreading the word. Since it opened in 1998, it has churned out 4,900 missionaries, only half of them from the US or Canada. While the temple at Chorley obviously has a definite religious - if slightly space age - feel, the plain brick buildings that surround it look more like a £39 a night motorway travel tavern than anything ecclesiastical. And many of those locals who pass by have little idea of the exact nature of the religious grouping behind their doors. Members of the church categorise themselves as Christians, although many in the Catholic, Protestant and Orthodox traditions have little truck with them. But if ordinary people know one thing about the Mormons, it's polygamy. The mere mention of the word sees a flicker of momentary discomfort pass across the faces of members, before they patiently explain the practice of having more than one wife was outlawed by the church in 1890. But Mormons don't get upset when you ask them to tackle certain accusations that float around on the internet. President Dean Richard Sorensen, a twinkly-eyed Mormon from Palm Springs, who heads the missionary training centre at Chorley, is all smiles as he dismisses the notion that Mormons are made to keep massive stocks of tinned goods in their home as insurance against the Apocalypse. "We have a year's supply of food and other essentials. That is not to do with the end of the world. Every family comes on hard times and we believe it is prudent to prepare." But ask anyone about Romney and you get a poker face. With the church having a strict doctrine of political neutrality, endorsement, even of the personal kind, is out of the question. Their missionaries stick to religious matters. President Sorensen describes them thus. "Their hair is cut and they are very clean and wholesome-looking. They are to live the commandments." Typically aged between 19-21 for the men and 21 up for the women, they spend three weeks here before embarking on a two-year mission. Paul Crapo, 21, is typical of those passing through the training centre. Clear-skinned, upstanding and besuited, a smiling paragon of all things Mormon. A senator's son from Idaho, he is currently pounding the streets of Manchester. "Every time I tell people about Jesus Christ, there's nothing like that feeling. It puts a fire inside you," he says. "I've been slapped in the face, I've been knocked on my head - a bit of physical, a bit of verbal abuse. It doesn't get me down. The thing which is the hardest is when people feel the same kind of spirit and decide to reject it." But what of the sacrifices of Mormon life? While their peers in the US and UK are enjoying weekends of inebriated hedonism, these young people accept a life not just without alcohol and tobacco, but without the possibility of tea and coffee, all forbidden by the church. Matthew Robinson, 22, from Sheffield, shrugs off the notion that he is enduring some sort of privation in missing out on an alcopop binge every Friday. "The reasons I follow the guidelines is because I know it's true. Because I know it's true it alters the way I behave," he says. And his fellow missionary, 20-year-old Derek Hull from Oregon is even more emphatic in his belief in a clean life. "I have a friend in jail, I have a friend that has got several girls pregnant I have a friend that was arrested and kicked out of school for selling cocaine." Dorm messages invite occupants to consider the spirit in all their thoughts and actions and "wear proper clothing". The temple here at Chorley is not a destination for day-trippers. It is not a cathedral, even members will only visit after being given a written "recommend". 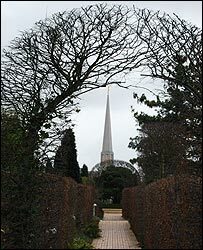 But some other parts of the complex are open to the non-Mormon population, and particularly the family history centre. The church is a major player in the genealogy sector because of its belief in the baptism of the dead. In an office there is a corporate-type slogan, encouraging members with the words "Let's all work to grow the stake". Stake is the Mormon equivalent for a diocese, a grouping of wards or congregations, which are the equivalent of parishes. And the parallels with business continue in the training centre. The casual observer might see something of their sales pitch buried in their manner. And at least a small part of their training covers how to deal with British reserve while getting all of the message across. Missionaries sit in a mock-up of a living room, a camera pointed squarely at their head, practising what they would like to preach on two church members pretending to be receptive unbelievers. The footage is then analysed in adjacent observation rooms. But the church's affable public affairs manager David Fewster is adamant that the church, despite its thorough organisation, hefty funding and rapid growth has nothing in common with a business. "We will never be in a situation where we teach missionaries to get their foot in the door," he argues. "They are not salesmen, they speak to people who are genuinely interested." And the church now has a massive presence in Britain. In the 19th Century members usually emigrated to the US, throwing up strange streets of Lancashire terraces in the heart of Utah. But from the 1960s the pattern has been for converts to remain and the church has now grown to 190,000 members in the UK. A chapel is built every other month in the UK. The church also has influence in the agricultural sector, owning 16,000 acres of farmland, much of it concentrated in East Anglia and focused on raising funds for charitable programmes. But the impression it leaves on its non-Mormon neighbours in surrounding Chorley seems generally to be a good one. Walk around in the immediate vicinity of the temple complex and you struggle to hear a bad word for the church. At the nearby Hartwood pub, barmaid Joanne Callander says they are good customers. Fruit juice is all they quaff, but "they're just really nice and pleasant". Customer Tony Knight, who sports a ring indicating membership of an organisation that has had its own problems with PR, the Freemasons, speaks of "absolutely marvellous boys". All in all it seems many in Chorley barely notice their Mormon neighbours, but despite this unobtrusive presence, the church continues its march in the UK. Not being a Mormon myself I do actually know a lot about them. In regards to "Baptisms for the dead" the church members do not baptise random people from the general public its is always ancestors hence the the name family history - and in relation to "if they did" those that are baptised have the opportunity the refuse it anyway. I was a Mormon for 21 years and served a mission as well. In 1994 I worked at the London Temple in England. I know the doctrines of the church very well and I am very familiar with its antics to convert people. Once you look beyond the clear cut missionaries and the soft spoken words... what you have is a dysfunctional organization with spiritual slaves. The average Mormon does not know the history and truth of the church and are constantly reminded by their leaders to trust in the inner feelings of the spirit as the proof of their faith. From somebody who belonged to the church and lived its principles, I can actually affirm that Mormonism has nothing to do with Christ or the God of the bible. However, the immediate dangers of Mormonism are more subtle and with far lasting real consequences. Characteristics of the church include their racial discrimination of anything less than white, strong and good looking, and the willingness of its leaders to lie at any cost to protect the institutional foundation of the church. My husband and I were actually up at the Temple site this last weekend for a wedding. The wedding took place in the main church building (stake centre) and was a very beautiful occasion for all involved. We found the Temple grounds to be clean and well kept - much like the Church's missionaries. All the people were friendly and made us feel very welcome. We enjoyed associating with them. We were pleased to witness that the marriage service was a Christian service and in our opinion, similar to one that you might attend in other Christian churches. If I was pressed to say what differences there were between this and other weddings that I have attended, then I would have to conclude that this "Mormon" wedding seemed more friendly and more personal than others. This may have been because friends of the couple gave talks of encouragement and advice as part of the service, and the "Bishop" actually knew the couple. As an ex-Christian, now Pagan, I love having debates and talks with people form other religions as long as they know what they're on about. I had a lovely conversation with two Mormon ladies at a bus stop about society and how young people need more help and support rather than being victimised. Regardless of whether I believe the same as anyone else, I respect their right to vocalise their beliefs, as long as they do it in an educated and controlled manner. We could all learn a lot from each other if we took the time to open our hearts and minds. 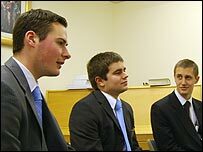 When I was a manager of a Mental Health Daycentre in Surbiton, I met two Mormon boys who offered to do voluntary work for the centre. I accepted them on the condition that they do not talk about their religion unles a member asked them about it. They were invaluable to the team and spent time talking and socializing with the members. Also cleaning and entertaining them with playing piano and games. Everone enjoyed their company and they were 'perfect' employees; never late and always entusiastic about the chores I gave them. One of the Mormon beliefs as indicated in the article is Baptism for the dead. This is why the Mormon Church has a huge ancestry site. They borrow wedding and baptism records from other churches on the pretext of updating their database, and then posthumously baptise those on record into the Mormon faith. How many people know that their deceased family members have been re-baptised into a faith that they don't want to be a part of? Since Jesus told his followers to take bread and wine as symbols of his body and blood, I wonder how Mormons take the Sacrament? I really hope the Mormon church will not 'continue its march' in the UK - leaving aside the fact that I believe the church's 'growth' figures should by no means be accepted at face value. Anyone considering joining this church should use the internet to research the very interesting history of this movement. The Book of Mormon mentions that horses were used in the Americas as early as 600bce, but historians know these were introduced much much later and no evidence has ever been found of the animals being in the Americas at this time. If this book was inspired why did the one who inspired it not know these things? 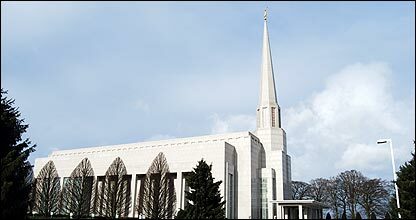 Despite the secretive nature of the Mormon temple in Chorley, in the period between building it and opening it the Temple was opened up to the general public. I took the oportunity to walk round and quickly realised that the interior had no resonance with my preconceptions. The first thing to greet the visitor in the temple doorway is a reception desk that would not look out of place in a luxury hotel. Past doorways beside the desk the interior is divided into a large number of rooms on 3 floors, which belies the impression of a large interior hall that convention might suggest. Overall the interior is expremely plush with the impression given of no expense spared on any aspect of construction or furnishing - right down to the marble doorways. I was particulary taken with the full size marble bull that supports the christening pool. Our guides were friendly and helpful and quite ecstatic that their Church had chosen to build a temple on this spot. It amazes me that media reports on the Mormon church are blatantly still looking for some hidden agenda or some strange, cult-like behaviour. Of course mormon missionaries are good people, of course young missionaries are trained before being sent out for two years and of course the neighbours have nothing bad to say about them. What did you expect? Virgin sacrifices? Just a side note - it's maybe not as unusual as one thinks to abstain from alcohol, tea and coffee - certainly anyone serious about eastern spiritual practices such as Buddhism or yoga and meditation usually does the same. We should as Christopher Hitchens has recently noted, assume that it is still right to ask questions about Mormon's rather odd if not offensive beliefs. Traditional Christianity may be able to offset some of its more bizarre stories against the whole pre-printed word/oral tradition and general prevailing cosmology of 2-2,500 years ago. Mormonism has no such defence as a near modern cultic variant. The fact is Mormon beliefs about the origins of the world are even more factually incorrect than those of the traditional Abrahamic monotheisms. The fact that they may be gaining in popularity is probably more a testament to organisational skills and the sight of a nice young man in a suit than anything else. As 'cults' go the Mormons are one of the least objectionable. Many years ago, they decided to build a church in South West London in the road where my family then lived. At the time we were having some building work done and they needed rubble to form the foundations for their building. We were more than happy to help them out and the young men/missionaries who were doing all the work themselves made absolutely no attempt to convert us - knowing that we subscribed to a minority non christian faith ourselves they were nevertheless grateful for the many glasses of juice my parents provided during that long hot summer. I frequently pass the Chorley site on my way to Yorkshire and I have always marvelled at the beauty of the building but have always assumed it to be a church of some sort. I'm fascinated to discover its purpose and the history of Mormons in my community just a stones throw from me. Many from my family joined the LDS's in the 1840s after falling out with the established church here and emigrated to the Salt Lake area. In one case giving the family name to a place just over the border in Idaho. A few years ago we met some of our distant relatives while on holiday in the US and were given a memorable guided tour around the Salt Lake City HQ, and all with no hard sell or pressure of any kind. Just a friendly curiosity about our lapsed C of E Protestant background. I visited the Mormon temple when it was open to the public for a few days after its completion. Very impressive inside, but I left feeling rather uncomfortable, especially with the matter of baptism by proxy. I understood there could be considerable competition among Mormons to receive the proxy baptism - total immersion - after the death of a prominent non Mormon eg. Princess Diana, even Shakespeare. No consideration seemed to be given if the deceased held strong religious views of their own, or even none at all. I felt just as uncomfortable in Temple Square when visiting Salt Lake City, but the rest of SLC was fine. Being a non-Mormon (indeed, an agnostic), who lived in Utah, I find it very refreshing to see a balanced, non-sensationalist article about the Mormons. Like any religion, there are extremists and there are those who are members in name, but do not ahdere to any of the practices. I have a good many Mormon friends and they are more warm and genuine than most other people I have met. Sadly, as the Mormon Church's public face, the missionaries are often confused with Jehovah's Witnesses. Thank you BBC for doing an honest and fair piece of journalism on the Church I believe to be true. We get so much bad press, and most of it is unfounded and the rest is based on the actions of 1-2 members that are not living as the church guides us to, but like to be called 'Mormons'. Always seem to be a friendly bunch of people, in fact shortly after the temple was completed a couple of young American Mormon preachers came round knocking on the door. Even though my mother made it clear we were Catholic they still took the time to teach me how to play baseball as they noticed a "ball and glove" lying in the hallway. A random memory from being a kid but sums up the type of people who are out there on the streets preaching. Definitely not an organisation deserving the sort of abuse they sometimes recieve. Until 1978, the so-called Church of Jesus Christ of Latter-day Saints was an officially racist organization. I urge anyone reading this to Google the name. I grew up with a Mormon church behind my house, my best friend back then was a Mormon and I got to know them very well, even going to the youth club they ran. All of them were great people, very nice and non-pushy about their beliefs even though they knew I wasn't one of them.